Post-war era, as we all know, were rarefied times. Alliances, polarization, distrust and loads of diplomacy were palpable in the air. The nuclear race and espionage were the national sports for the world greatest powers. Ian Fleming took those subjects to the table brilliantly in 'Moonraker' where, the 007 will discover a great conspiracy behind the mask of a perfect citizen. Bond is appointed for an apparent simple mission, to use his gambling skills to discover the tricks that Sir Hugo Drax, a very respectable citizen, uses to win huge sums on the tables. After a fantastic performance as an actor and playe,r and getting M close to a nerve breakdown, Bond leaves Sir Drax without a penny in his pocket and with a big humiliation as he cannot complain unless wishes to put himself on an embarrassing situation. From here, Bond will take over a different task, to take personal care of the Moonraker, the most important step on the nuclear race for the Empire and with Sir Hugo Drax as the head of the project. Very soon, Commander Bond will find out why people says: 'once a cheater, forever a cheater'. Bond will need to risk his life to uncover a secret operation that, if successful, would lead to the armageddon. Keep an eye: on the carefully built character of Sir Hugo Drax, feelings, ideals, rancor, fanatism, etc. Of course, you must enjoy reading about Bond's gourmet facet and his cold blood. Worth to mention how enjoyable is the card game and an amused of Bond pretending to be a drunk messy gambler and the stress of M who, despite all, trust blindly his faithful secret agent. 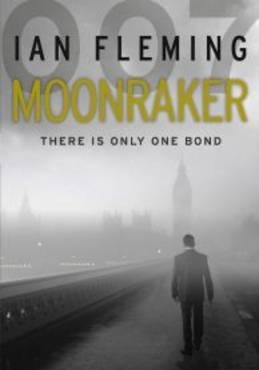 By far, Moonraker is the novel that gives the deepest print of Bond's character and where Fleming made use of many stereotypes typical of the era. Also, this novel let us see a little of the lonely man beneath the tuxedo. 'They want us dead,' said Bond calmly. 'So we have to stay alive'.